In his two newest Zelda Month videos, PeanutButterGamer decided to tackle the second Zelda game for the CD-i console, The Wand of Gamelon. As I’m sure you’re all aware, these games are famously awful in every way, from the flawed gameplay to the hilariously bad animated cutscenes that portray nearly every character as an incoherent idiot. As this is kind of a long game, Austin had to split it up into two parts: one released last Saturday, on schedule, and the second released earlier today. These videos are a sort of continuation of a video he made last year, where he played another CD-i Zelda game, Link: The Faces of Evil. If you like his content, you should check out some more of his Zelda Month content from the past few years on his YouTube channel; so far this November, he’s played Hyrule Warriors and taken a look at the old Zelda cartoon from the 80’s, among other things. What do you think? 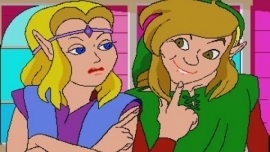 Have you ever actually played the CD-i Zelda games yourself? Let us know in the comments below!